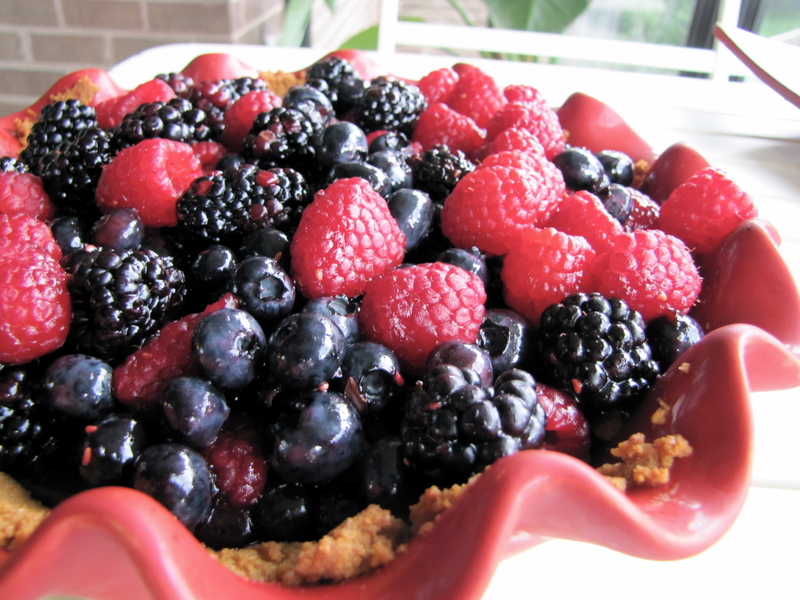 Summer Berry Pie – Voila! Chock full o’ fresh berries, delicious graham cracker crust and a dollop of freshly whipped cream equals one amazing dessert. I don’t even know what to say next except the picture speaks for itself and your tummy will thank you later. p.s. this pie needs about 3 hours to set in the fridge! 1. In a food processor, process graham crackers until evenly fine. About 30 seconds (you should have 1 cup of crumbs). Add sugar and pulse to combine. Continue to pulse while adding warm melted butter in a steady stream; pulse until mixture resembles wet sand. 2. Transfer to a 9-inch glass or ceramic pie plate. Using the back of a spoon spread crust evenly over pie plate and up the sides. Bake until crust is fragrant and beginning to brown, 15-18 minutes. Transfer to a wire rack and cool completely. 1. Combine berries in a large colander and gently rinse. Spread berries on paper towel-lined baking sheet and gently pat dry. 2. In a food processor, puree 2 1/2 cups of the berries until smooth, about 1 minute. Pour puree into small sauce pan. 3. In a small separate bowl, combine sugar, cornstarch and salt. Whisk to combine then add to puree mixture. 4. Bring puree to a boil over medium heat, stirring constantly with a wooden spoon. When the mixture reaches a boil and is thickened to the consistency of pudding, remove from heat, stir in lemon juice and set aside. 5. While the puree is cooling, place remaining berries in a medium bowl. Heat jelly in a small ramekin in the microwave for about 10 seconds, or until warm and melted. Pour jelly over the fruit, gently combine and coat evenly. 6. Pour puree over cooled crust (if it’s not cool yet, stick it in the freezer for 5-7 minutes). Distribute berries over puree. Loosely cover pie with saran wrap and place in fridge until puree has set, at least 3 hours. Cut and serve with whipped cream.